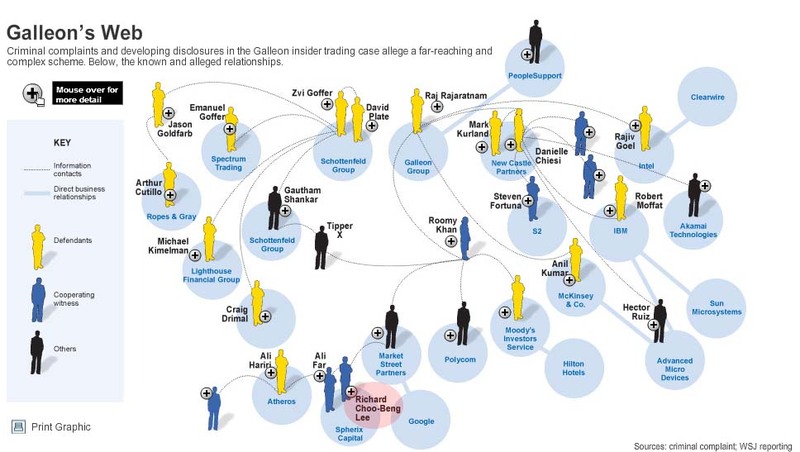 At last count, the insider trading ring that was originally busted in mid-October has already included roughly 30 people arrested so far. With high profile funds like SAC Capital being closed in on, it’s helpful to get a better idea of how this thing was actually run. The below infograph comes to us from the Wall Street Journal via Zero Hedge. You can click on it to embiggen. Don’t lose interest in this story just yet, it just feels like the busts are going to get bigger before this goes away. The Street is quaking in their Gucci loafers right now.